Rob de Ree - NorthSea Therapeutics B.V. 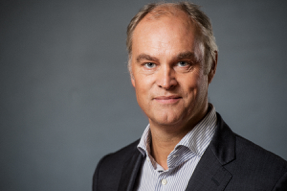 Prior to joining NorthSea Therapeutics B.V., Rob de Ree served as the CEO of the start-up companies Dezima Pharma, which was acquired by Amgen in 2015 and as the CEO of BMEYE which was acquired by Edwards lifesciences in 2012. Before that Rob de Ree served as the head of the licensing business of Crucell and in various national and international sales and marketing roles at Medtronic. Rob de Ree started his career in pharma in 1991 in sales and marketing at the cardiovascular division of Byk Gulden in the Netherlands. In addition Rob de Ree is currently a board member at Ventinova (chair) and Mellon medical and operating partner at Biogeneration Ventures. Rob de Ree holds an MSc in pharmacy from the University of Groningen.